Although sleep apnea is a common disorder, it remains something of a hidden threat to many citizens throughout the U.S.. This is primarily due to a lack of awareness that surrounds the ailment, and the fact that many sufferers may not even be aware that they have an issue which requires medical attention. Even for those who are aware that they suffer with the disorder, there are aspects of it that they may remain unaware of, and the fact is that sleep apnea can create additional health issues for those about to undergo bariatric surgery. 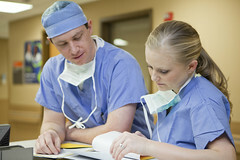 Featuring a variety of techniques for reducing a patients stomach size with a view to encouraging long term and sustainable weight loss, bariatric surgery is one of the most commonly undertaken and safe procedures available. It is also an extremely effective procedure, and one that can assist obese patients in reducing their weight and maintaining a more healthy lifestyle. Despite this, however, a recent study has revealed that under treated and obstructive sleep apnea is a contributing cause of deaths among patients who have had bariatric surgery, especially during the first 24 hours after the procedure. The study was prompted after a small minority of patients died suddenly in the aftermath of bariatric surgery, despite having no immediate or obvious complications from the procedure. The initial findings found that these patients suffered from periodical deficiencies in oxygen in their arterial blood, which lasted for anywhere between 20 minutes and several hours. As blood oxygen subsequently fell dramatically, medical experts confirmed that obstructive sleep apnea remains the single most likely cause of this development, which makes the need for increased patient awareness even greater than it was previously. Whether you are diagnosed with sleep apnea or not, it is imperative that you raise the issue with your surgeon prior to undertaking bariatric surgery. They are best placed to advise on the most suitable course of action, whether you choose to seek alternative treatments or undergo a sleep study test to determine whether or not you are afflicted with the disorder. In fact, given the serious and often unheralded threat posed by sleep apnea, it is worth obtaining a diagnosis whether you are looking to have surgery or not, as this will boost your awareness and help to improve your overall health. Dr. Dan Matthews, DDS offers a take home ARES sleep study to help find out if you are suffering from sleep apnea. Contact our office today for a complimentary consultation. Do Dogs have Sleep Apnea Too? Does Your Dog Have Sleep Apnea? A Connection Between TMJ Pain and Sleep Apnea? Sleep Apnea Related to Atrial Fibrillation?